I love to bake breads from all around the world during Easter and Christmas. Yes, I take culinary travels through different countries. In India where I born and brought up, doesn’t have any yeasted bread that are made during Easter and Christmas. My journeys in the previous years led me to Greek Easter bread, Italian Easter bread and Greek Easter cookies. 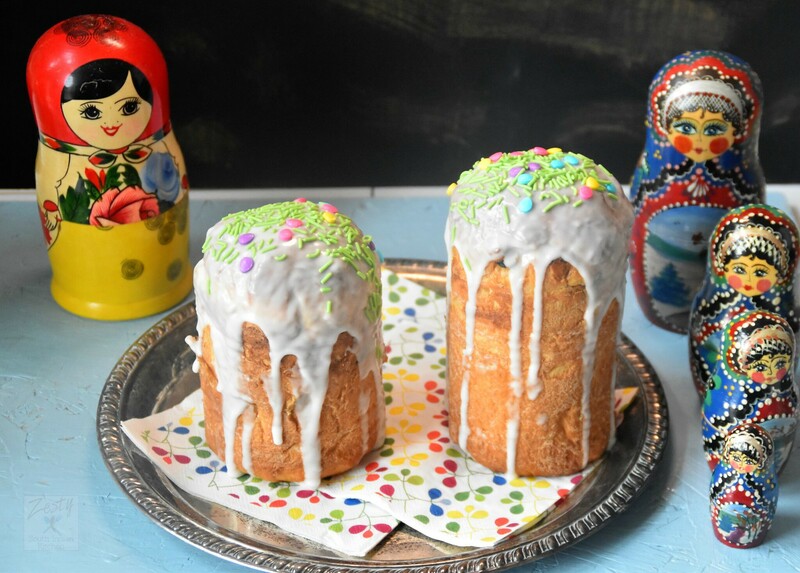 This year I decided to try Kulich Russian Easter bread rich in butter and eggs. I made three small bread. Kulich is a lightly sweet, rich yeast bread. It may also contain raisins, almonds, candied or dried fruit, lemon zest, and various spices including cardamom or saffron depending on the recipe and personal choice. When I searched in the internet I found a YouTube video showing a small Russian bakery woman baking kulich with raisins. So, I used raisins and dried apricots and added cardamom as it is my favorite spice. The top of each loaf is called a crown. It is usually topped with a powdered-sugar frosting which is allowing to drizzle down the sides of the bread. The spikes created is reminiscent of Christ’s crown of thorns. 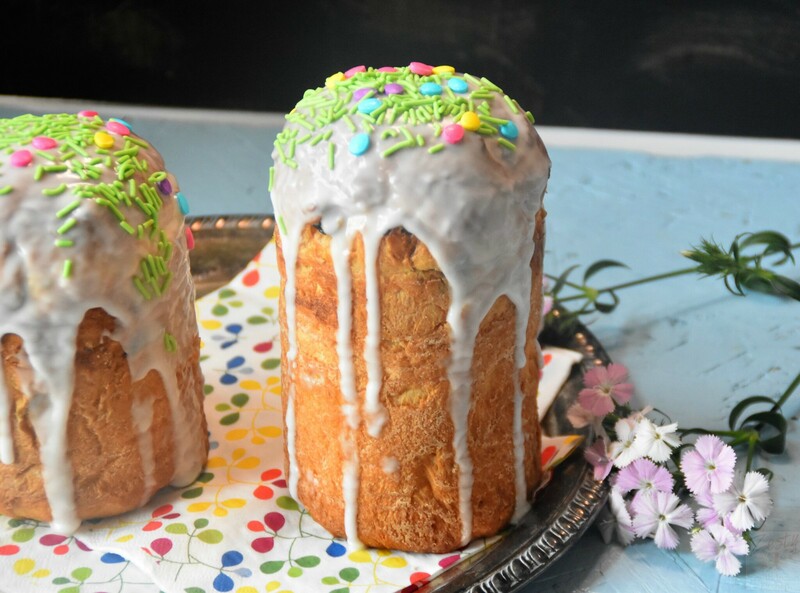 Kulich is traditionally eaten only during Easter. It is placed together with Easter eggs and served with rich cottage cheese dessert made with, dried fruits, nuts and butter. Before consuming, Kulich is taken to a priest to be blessed on the Thursday service before Holy Friday. I read that there is a traditional method to carving a loaf of Kulich. First, the crown is cut off, and then the loaf is sliced horizontally and then cut in wedges to be distributed to members of the family. The crown can then be placed back on top, keeping the aesthetic appeal of the loaf and preserving its moistness. Kulich is usually round and tall. It is an important ceremonial duty of women of the house to bake the Kulich, as the fate of the family depended upon it. I also read a superstition related to baking of Kulich. If it rises well and has a nice dome, then the family will be alright, but if the dough does not rise in the oven or it crust cracks then expect disaster. 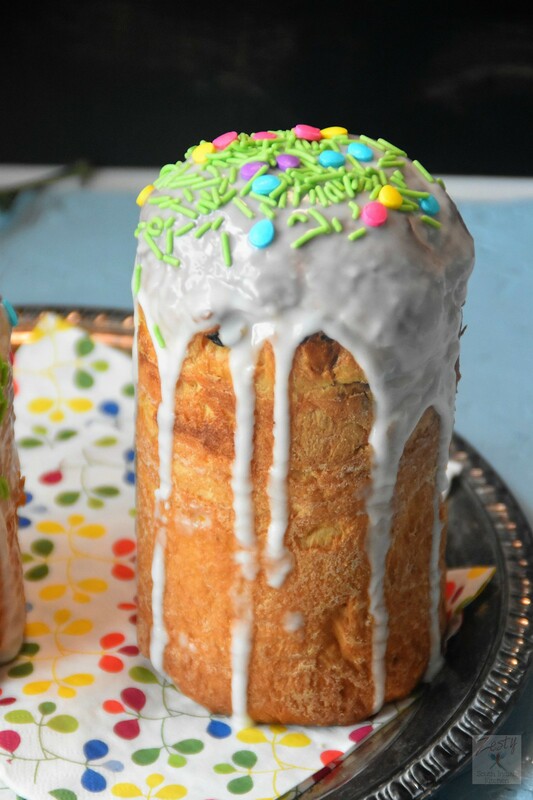 The Kulich is traditionally frosted with a thick, powdered sugar glaze, which can drip down the side. It can be glazed or not glazed. In some peasant households in Russia, the top is often not glazed and is simply marked by cutting a cross. I watched few videos of Kulich making and based on the common themes, came up with this recipe. I didn’t make the glaze with raw egg whites, as I needed to give to kids and didn’t think it would be safe. If you use glaze with egg white it is thick, and drizzle will be small. I used lemon juice and powdered sugar to glaze. And let my kids to top them with colorful Easter egg sprinkles. They were happy to help in that case. Give it a try and let me know how it turned out. 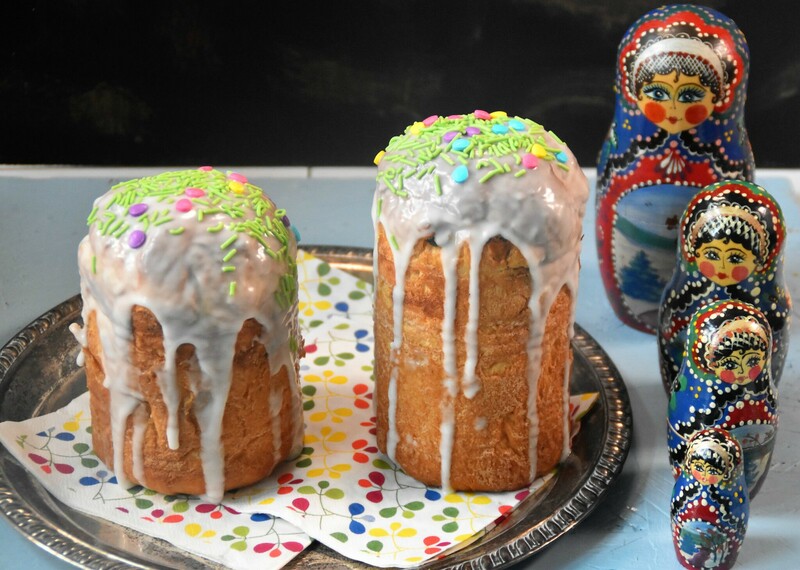 Delicious Russian Easter bread Kulich made with raisins, apricots with orange zest and exotic cardamom. Great traditional bread made only during Easter Time. In a small bowl add 50g of flour, ¼ cup of luke warm milk and yeast and mix well and set aside until it becomes frothy and bubbly. In a large bowl add flour, salt mix well and set aside. In another bowl add egg, egg yolk and sugar and butter and mix well. If you want beat, you can do that at this time. Then add egg -butter-sugar mixture to flour mixture and add yeast mixture mix (sponge) cardamom, orange zest, combine everything until it become soft sticky dough. Transfer to lightly floured area and knead well until you get a soft and supple dough. Transfer to greased bowl for double in volume it takes about 1-1 ½ hours depending upon the kitchen temperature. While the dough is doubling, puff up the raisins but adding them to hot water and drain and set aside. This step is optional, but I did it. Once the dough double in volume punch down and spread it as rectangle and add raisins and chopped apricots. Try to incorporate well. This recipe makes about 833g of dough. I divided two 333g and one 167g. You can divide the dough depending upon size of the tin. Transfer the divide dough balls into well buttered floured tins. Set aside for until the dough double to slightly above ¾th of tin. Bake it in pre heated oven at 375F for 10 minutes and then reduce the temperature to 350F and bake it for 20 minutes. If the top start to brown cover with aluminum foil and bake. Once the tin is cool enough to touch, slightly run the knife through the sides of tin and carefully remove the Kulich and set aside. Make a thick glaze with confectioner’s sugar and lemon juice and drizzle over the top of the bread. Add sprinkle on the top. I love the flavors that are in Kulich, the orange zest, apricot and raisins with cardamon. I thought of coffee tins the moment I saw the recipe. I am going to attempt making it this week, I will let you know. This brings back memories of childhood. My baba made Easter bread….and I always loves eating it. Ours did not have icing. I remember it had a nice yellow colour…and was studded with raisins. Thank you so much for the tips about the glaze without raw egg when giving this to kids – that was perfect! That looks like the perfect Easter bread. I like to bake Easter breads too and there are so many varieties from all over the world. Kulich is new to me and I’m going to bookmark it to try for next year. Oh, how wonderful is that? I love how pretty it looks. My kids would love this. Use to buy Kulich a long time ago but have not seen it here in years. Must try making it. Happy Easter Swati. I think it’s great carrying the traditions with the Holiday desserts and dishes. I think every cuisine has a their special holiday bread. This one reminds me of the Italian Christmas bread – panettone. I’d love to try this one. Wow I learned something new today! I have never heard of Russian Easter bread before. It sound fantastic! I made this over the holiday weekend and it was such a success!!! Everyone raved about it! Yeast recipes can be daunting but yours was so easy to follow.